When it comes to winter weather, we’re all for inappropriate behavior. Give us your damp, penetrating cold, your pelting graupel and your outright-nasty winds. Those “bad” conditions are simply more reason to revel in the season when you’re wearing the tenacious Rubicon. Patagonia's Rubicon Jacket combines a tough shell fabric and stay-warm-when-wet insulation to keep you warm and comfortable ripping it up while everyone else is holed up with a latté and chili mac. The exterior is made of durable 70% recycled polyester ripstop (70% recycled) with a DWR (durable water repellent) finish to snub wind and moisture. Inside, a soft layer of compressible 150-g Thermogreen® polyester (90% recycled) insulation (100-g Thermogreen® in the sleeves) adds heat to thwart icebox temperatures. 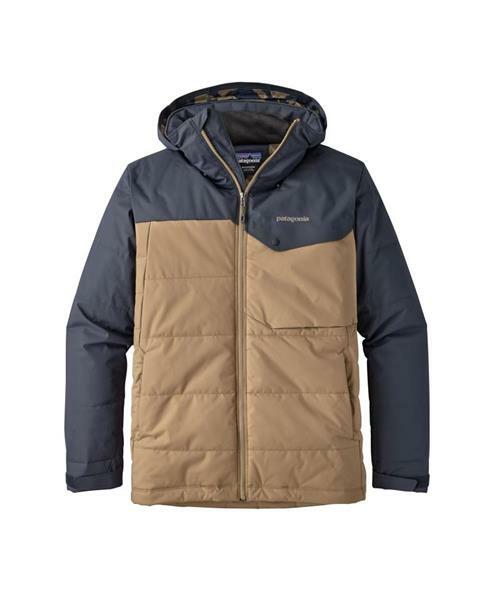 Finer points include articulated arms; pit zips; an easy-gliding liner; a zip-off powder skirt (with webbing loop that attaches to any Patagonia® Snow pants); a helmet-compatible hood with a single-hand adjustment; and zippered pockets, including two handwarmers, one chest with media pocket and cable routing and one internal stash. There’s also an internal drop-in for gloves and goggles, and an embedded RECCO® avalanche rescue reflector.